Coins certified by Numismatic Guaranty Corporation® (NGC) topped the Heritage Auctions World and Ancient Coins sale held January 6-7, 2019 in New York. In all, 10 lots of NGC-certified coins realized prices greater than $100,000. The sale’s highlight was the 1728 Netherlands East Indies Gold Proof Pattern Ducaton, graded NGC PF 64, that realized $336,000, far exceeding its pre-auction estimate of $80,000 to $100,000. 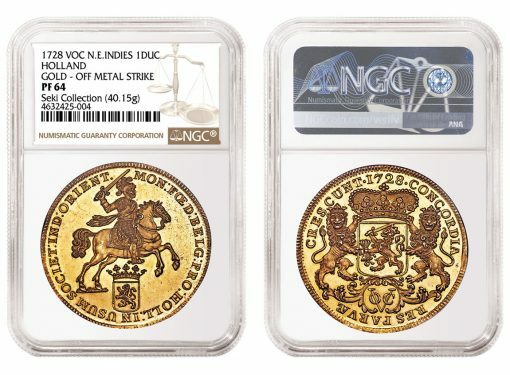 The 1728 Gold Proof issue, likely created as a presentation issue for important officials and friends of the East India Company, was struck in documented weights of 37.80 grams and 40.20 grams. This example is of the heavier standard and displays a level of preservation and eye appeal that is virtually unheard-of for the issue. Several British coins also achieved impressive results. 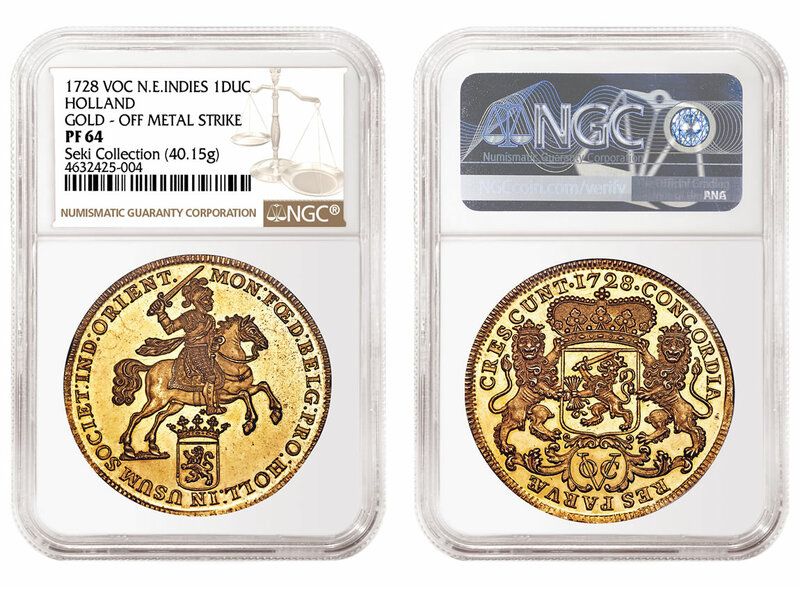 These included an NGC-certified Great Britain 1741/38 George II Gold Five Guineas that sold for $240,000. It is the finest-graded example at NGC MS 64★. Another significant result for a British coin is the $204,000 realized for an NGC PF 64+ Cameo 1817 Three Graces Pattern Silver Crown. Many numismatists consider the Three Graces Pattern, so named for its stunning reverse design of the Three Graces from Ancient Greek mythology, to be one of the greatest British coins ever struck. Only 50 of these patterns were produced and few have survived in such exceptional condition. This result was closely followed by the $192,000 paid for an NGC-certified 1893 Victoria Gold & Silver Complete Proof Set. It is believed to be the finest known out of an original issuance of 797 sets. Finally, another strong result was achieved by a Great Britain 1887 Gold Sovereign. Graded NGC PF 66 Ultra Cameo, it sold for $156,000. NGC-certified ancient coins also performed exceptionally well. A gold aureus of Probus (AD 276-282), graded NGC Ancients MS ★ 5/5 Strike, 4/5 Surface, Fine Style, sold for $156,000, or nearly double its presale estimate. The top ancient coin in the auction, this Roman rarity is part of the Morris Collection, which was almost entirely certified by NGC. 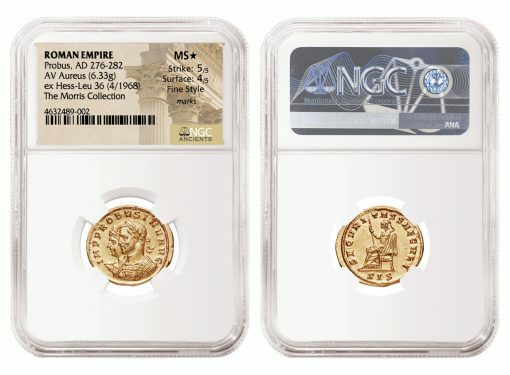 This coin was followed by an NGC Ancients-graded gold aureus of Victorinus (AD 269-271), which sold for $144,000. It was graded NGC Ancients XF ★ 5/5 Strike, 4/5 Surface, Fine Style. "Our NYINC World and Ancient Coins Platinum Night Sale again illustrates the value that NGC’s certification adds," said Cristiano Bierrenbach, Executive Vice President, Heritage Auctions. "Many NGC-certified coins sold for prices that were significantly greater than even our highest pre-sale estimates. Our bidders trust NGC." "These outstanding results are a clear indication of the strength of the world and ancient coin market and of NGC-certified coins in particular," said NGC Chairman Mark Salzberg. "Recent auction results have shown that collectors of these coins place considerable weight on NGC grading." Lot 34264 – Great Britain: Victoria Gold Proof Pattern Crown, graded NGC PF 65 Ultra Cameo. Price realized: $156,000. Lot 32228 – Roman Empire, Probus, AD 276-282, Gold Aureus, graded NGC Ancients MS ★ 5/5 Strike – 4/5 Surface Fine Style. Price realized: $114,000. Lot 34196 – France: Alexander I of Russia Gold "Peacemaker" Medallic Essai 5 Francs 1814, graded NGC MS 63. Price realized: $108,000. The Heritage auction was held in conjunction with the New York International Numismatic Convention (NYINC).